Tim order this customer matched pair of Performance Hybrid Nylon Whips for Angie in time for her Birthday! Happy Birthday Angie!!! Look at MidWestWhips or The Whip Chick’s Nylon Whips page for more information on how to order your own Performance Hybrid whips made by Lauren Wickline, or look at our Whips In Stock page to see if we have any already in stock at the moment. 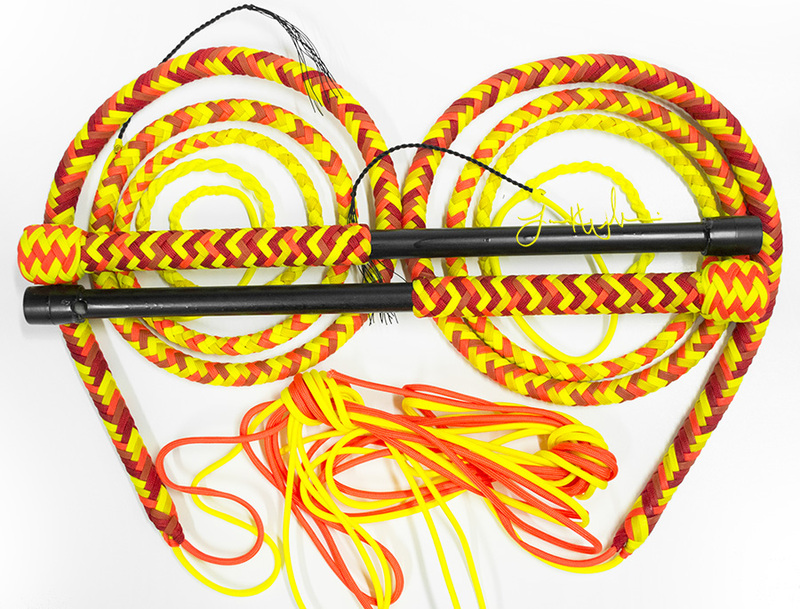 This eye-catching matched pair of Performance Hybrid Nylon Whips was made for Kenneth. This is my Phoenix Burn pattern which includes Imperial Red, Scarlet, Solar Orange, Neon Orange, Yellow, and Neon Yellow parachute cord. A full flame gradient. Look at MidWestWhips’ or The Whip Chick’s Nylon Whips page for more information on how to order your own Performance Hybrid whips made by Lauren Wickline, or look at our Whips In Stock page to see if we have any already in stock at the moment. 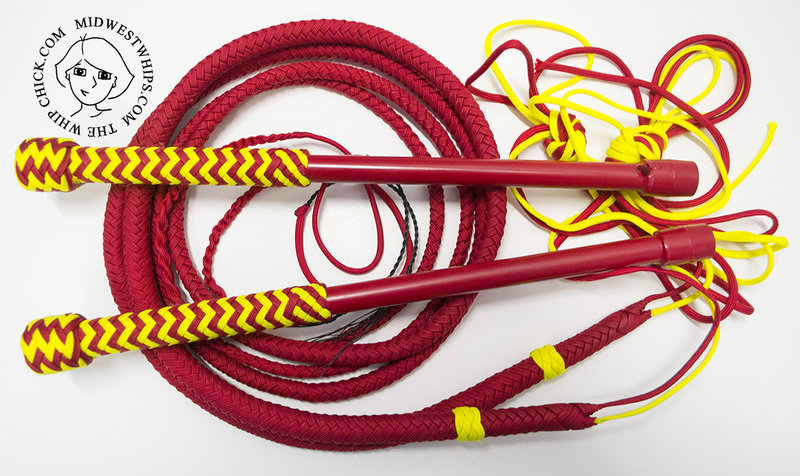 This standard pair of Nylon Performance Hybrid Whips was made for Kenneth from Imperial Red and Neon Yellow Paracord. Christina’s custom matched pair of PH Nylon Whips starts with solid Colonial Blue thongs that fade into solid Neon Yellow at the tips. Look at MidWestWhips Nylon Whips or The Whip Chick’s Nylon Whips page for more information on how to order your own Performance Hybrid whips made by Lauren Wickline, or look at our Whips In Stock page to see if we have any already in stock at the moment. I plaited this Performance Hybrid Nylon Whip for Cori from Neon Yellow, Charcoal Gray, White, and Black Parachute Cord. Violet cracked her brand new pair of PH Whips for the first time with us yesterday evening against an intensely blue desert twilight sky and full moon rising in the distance. And thanks to how brilliantly bright these whips are, she was able to keep cracking with us under the light of the moon until it was much later than we all realized! The paracord colors I used to make her matched pair include: Imperial Red, Scarlet, Solar Orange, Neon Orange, Yellow, and Neon Yellow. Check out our MidWestWhips Nylon Whips page for more information on how to order your own custom Performance Hybrid whips, or look at our Whips In Stock page to see if we have any already in stock at the moment. This matched pair of PH Whips was made for Kim using Neon Orange, Imperial Red, and Neon Yellow paracord. Check out our MidWestWhips Nylon Whips page for more information on how to order your own custom Performance Hybrid whips, or look at our Whips In Stock page to see if we have any already in stock at the moment.